Don’t let the recent influx in video game posts fool you: I don’t have a ton of time to play video games. Between classes, my on-campus job, and everything else I do since college has completely absorbed my life, I don’t really have the time I used to to just sit down and play for hours. Even over my recent spring break, where I put I found some time to complete Batman: Arkham Asylum again, I was so absorbed in school work that I didn’t feel like I had a break. 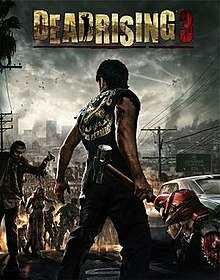 Well, over the last couple weeks, I have been dedicating what little free time I had to a game that has been on my list for a while: Dead Rising 3. A few nights ago, I finally beat it, and boy did I have a great time. You might be thinking, “Should I give it a try? I like video games!”, and if you’ve ever read any of my posts before, you know this answer is yes. Dead Rising 3 is a continuation of the main Dead Rising franchise from Capcom. For those unfamiliar, the Dead Rising series is all about fighting zombies. The series is known for its strict time limit (you only have X amount of in-game days to complete the main story and all the side missions! ), crazy zombie-killing violence, and adherence to the rule “if you can pick it up, it can be a weapon”. Dead Rising 2 introduced the idea of combo weapons, which combine normal items into crazy machines of destruction. Each game in the series takes place in a unique location: the first game was set in a mall, and the second in what was basically the Las Vegas Strip. Dead Rising 3 takes everything the other games have established, and perfects them. At least, in my opinion it does. In Dead Rising 3, you play as Nick, a mechanic in the fictional city of Los Perdidos. A zombie outbreak, something that the government usually controls in this universe, has started, and Nick finds himself in desperate need of escape. The game is brutal, engaging, and a great time-killer. The story is strong and fun, but doesn’t really tread new ground for the series (besides a few key plot points I won’t spoil here). Where this game really shines is in the improvements to classic Dead Rising tropes. The city of Los Perdidos is completely explorable, and apparently can hold both maps from the first two games with room to spare. The zombies are all unique and terrifying, and the improved survivor side mission system is fantastic. Gone are the days of having to find a bathroom to save your game in; you can simply save from the pause menu now! Plus, combo weapons no longer require special benches and maintenance rooms to build in; you can build them anywhere! Of course, as most zombie games, this game is violent and scary, and not suitable for all age groups. It is rate M for Mature, after all. But, if you find yourself stressed and in need of some good fun, this game is definitely for you. If you’re a fan of the Dead Rising series, I definitely recommend this game. If you don’t like all the streamlining it’s done for new players, don’t be upset; you can play Nightmare Mode, which makes it more like a classic Dead Rising experience. I highly recommend this game. Hey everyone, thanks a lot for reading. Finals week is rapidly approaching, and this being the spring semester of my Junior year, it’s gonna be intense. I really enjoy writing these every week, so thank you, truly, for reading. It means so much.